It’s that time of year again: that sneezin’ wheezin’ season where airborne pollen takes wing and allergies bloom in full force. That’s the bad news. The worse news? According to the World Wildlife Federation, global warming will worsen allergies for more than 25 million Americans. That’s because ragweed—a primary allergen-producing plant—grows faster, has more allergenic content and is more unchecked with higher carbon dioxide levels in the atmosphere. Overall, a warmer climate means longer growing seasons, which produce more pollen, making allergy sufferers more miserable. In fact, the United States has also seen a shift in USDA Plant Hardiness growing zones, with colder zones decreasing over the years. To wit: across the country, spring is arriving up to 14 days earlier than it did 20 years ago, according to the U.S. Global Change Research Program. That means longer and stronger allergy seasons—and some areas might be in perpetual bloom. This year, Jackson MS has the dubious distinction of being number one on the Asthma and Allergy Foundation of America’s (AAFA) “Most Challenging Places to Live with Spring Allergies” listing, followed in the top five by Memphis, TN, Syracuse, NY, Louisville, KY, and McAllen, TX. 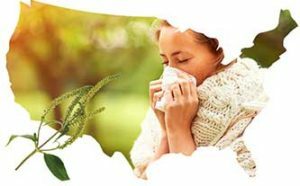 To get a better sense of daily risks, allergy sufferers can log onto the National Allergy Bureau website (www.aaaai.org/nab) to track pollen counts by area. Then, they can take steps to minimize exposure. One great way to minimize exposure is to eliminate allergens from the air altogether. While that may seem like a pipedream to some, AeraMax Professional’s line of air purifiers actually reduce 99.9% of allergens from indoor air, using HEPA filtration and cleaning the air in four stages. In fact, AeraMax Professional is the first commercial grade air purifier to receive asthma & allergy friendlyTM Certification from the AAFA. And that’s nothing to sneeze at. Put me in, Coach! Fall Allergies: What You Can Do AeraMax Professional Wins Big Which Commercial Air Purifier is Right for You?